Jeremy Larkin dives forward. The redshirt freshman and the Wildcats pulled out a win against Nevada on Saturday. 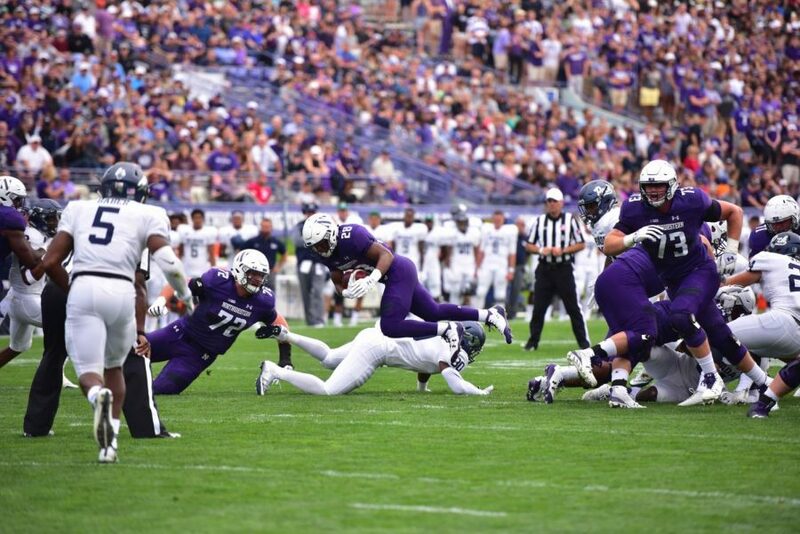 Northwestern shook off early cobwebs in its season opener Saturday, pulling ahead late in a tense non-conference win over Nevada at Ryan Field. tying his career high — and a pair of touchdowns. Thorson snuck through the Nevada line for the Cats’ go-ahead touchdown with 5:28 to play on a critical fourth-and-one and scored on another quarterback sneak in the final minute. Senior safety Kyle Queiro also nabbed a fourth-quarter interception in the victory. NU dodged the type of early season setback that hung over the team last year, when it lost to Western Michigan in the season opener and then fell the next week to Illinois State before finding its footing. The Cats will head to North Carolina to visit Duke next week and return home against Bowling Green on Sept. 16. 1. Ben Skowronek looks like the new Austin Carr. Questions lingered all offseason about who would replace the production of Carr after he hauled in 90 catches for 1,247 yards as a senior in 2016. On Saturday, it was Skowronek who filled the void, hauling in eight catches for 123 yards. Thorson relied on the 6-foot-4 wideout throughout the afternoon, and the sophomore delivered timely catches. 2. NU may rely on Justin Jackson more than ever.The senior running back has been an iron horse for the Cats for the past three seasons, but if the Nevada game is any indicator, his role may yet grow larger. The “Ball Carrier” not only ran the ball 30 times, he also caught five passes. Even if the Cats continue to build on the pass-heavy approach they established a year ago, expect to see plenty of Jackson both on the ground and as a key safety valve for Thorson through the air. 3. The Cats are far from ready for primetime. Facing a Nevada squad led by a first-year coach in Jay Norvell, many expected a fast start from an NU team with high expectations. Instead, the Cats sputtered out of the gate before pulling out an ugly win. Without stalwarts from last year’s team like linebacker Anthony Walker and defensive end Ifeadi Odenigbo, the Cats’ defensive front struggled all day against Nevada. Facing an anemic pass rush, Wolf Pack quarterback Ty Gangi connected on several deep passes, finishing with 199 passing yards. And offensively, NU struggled at times to find rhythm behind spotty offensive line play.